During July 2001 salvage excavations were conducted in two spots where the Upper Aqueduct to Caesarea crosses Nahal ‘Ada (Permit No. A-3455*; map ref. NIG 19270–90/21521–45; OIG 14270–90/71521–45), as part of the project to improve the drainage of the wadi channel and enlarge it. The excavation, on behalf of the Antiquities Authority, was directed by G. Birman and U. ‘Ad, with the assistance of H. Eliaz (Area B supervision), S. Ya‘aqov-Jam (administration), A. Hajian, V. Pirsky and V. Essman (surveying and drafting), T. Sagiv (photography), M. Shuiskaya-Arnov (pottery drawing), Y. Gorin-Rosen (glass), P. Gandelman (pottery reading), Y. Marom and Y. Sa'ad (conservation), J. Peleg and Y. Porath. The ‘Upper Aqueduct’ to Caesarea includes, in this section, the ancient aqueduct (A; Phase A), another aqueduct that was built next to and north of Aqueduct A in the first half of the second century CE (B; Phase B) and an aqueduct/channel that was built above Aqueduct B, superseding it (C; Phase C). 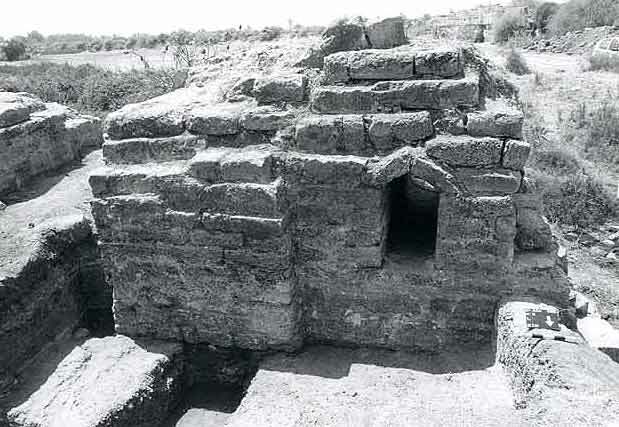 Problems pertaining to the maintenance of Aqueduct A called for a bypass in the shape of a half octagon that was constructed in this section at some point (D; Fig. 1; see J. Peleg 1989. The Water System of Caesarea. The Aqueducts of Ancient Palestine:115–122; ESI 9:130–131). The excavation area was northwest of Moshav Bet Hananya in the southwestern corner of the ‘bypass’, at a point where the aqueduct crosses Nahal ‘Ada. It was conducted on both banks of Nahal ‘Ada, on either side of the aqueduct whose foundation was exposed for a distance of c. 20 m (Fig. 2) and comprised a system of arches (Loci 100, 112, 113, 115) that supported it. The aqueduct was only survived by its floor in this section. On the western bank, the area where the aqueduct turns from the west to the northwest was exposed. The northern face of the aqueduct’s foundation was thickened, its courses were stepped and the bend in the channel was gentle. One arch with a span of 3.6 m was completely exposed to its foundations (L112). The swampy and unstable soil in this region of the aqueduct caused it to subside and partly collapse, which required repairs and reinforcements over the years. Adjacent to the western pier of the aqueduct’s arch a retaining wall (1.0–1 .3 m thick) that narrowed the passage (Fig. 2, No. 1) was built. A thickening (4.1 m long, 1 m wide; Fig. 2, No. 2) on the northern side of the aqueduct, west of Arch 112 and another thickening (15 m long, 2.5–3.5 m wide; Fig. 2, No. 3) on the southern side of the aqueduct, were exposed. The upper courses of the thickening were stepped and a bowed aperture, perpendicular to the arch (Fig. 2, No. 3B), was identical in width to the span of Arch 112 after its constriction by Wall 1. On the eastern bank, the foundation of the aqueduct and the floor of the channel, built the length of two arches (10 m; loci 100, 113), were excavated. As was the case on the western bank, here too, repairs and reinforcements were applied to the aqueduct. Two plaster floors were visible in the channel (elevation 8.39 and 8.66 m above sea level), attesting to two phases of use. On the southern side of the foundation, opposite the piers, thickenings that were constructed as stepped courses (Fig. 3) were exposed. The eastern end of the thickening next to the western pier was preserved (4 m thick; Fig. 2, No. 4). Another thickening (2 m thick; Fig. 2, No. 5) was built adjacent to the eastern pier. A wall that varied in thickness from 0.2 m next to Thickening 5 to 1 m next to Thickening 4 (Fig. 2, No. 6) was built between the two. It seems that the two arches (Loci 100, 113) collapsed at a certain point and were rehabilitated. Arch 100 was rebuilt with a double arch whose exterior arch had the same diameter as the original one. A new arch whose diameter was greater than the original one was constructed in Arch 113. 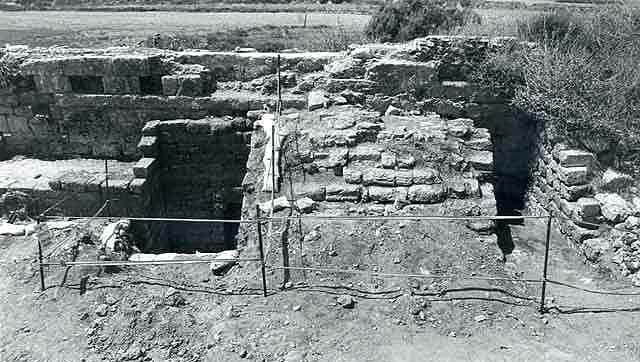 Retaining walls that formed a passage with a rectangular opening (c. 1 m wide; Fig. 2: Section 1-1) were built inside Arch 113. 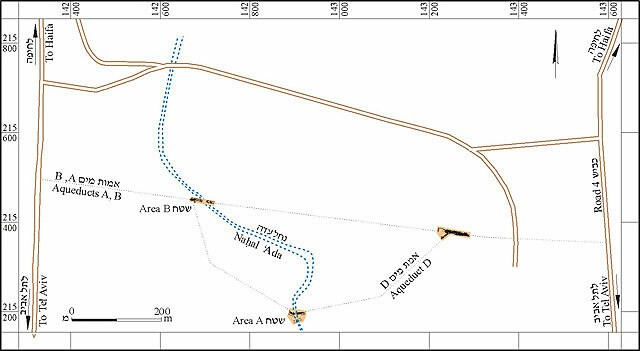 The area is located on both banks of Nahal ‘Ada, east of the meeting point between the ‘High Aqueduct’ and the bypass (Fig. 4). The plaster floor of the aqueducts’ channels was only preserved north of the connection with Bypass D. The elevation of the original floor in Aqueduct A was 8.18 m; however, remains of another upper floor were discerned at elevation 8.39 m. The original floor elevation in Aqueduct B was identified at 8.27 m (elevations are above sea level and measured opposite the connection to Bypass D). Seven piers were exposed in their entirety, two on the western bank of Nahal ‘Ada (Nos. 2, 3), three on the eastern bank (Nos. 4–6) and two others were cleaned, one on each bank (Nos. 1, 7). The piers were set on a platform of fieldstones that was meant to provide a stable base for the foundations of the aqueduct on the clayey and swampy ground. The excavation exposed remains of piers from Phases A and B (Fig. 4: Section 2-2), which were dismantled in this section almost to their foundations and the piers of Aqueduct C were constructed above their remains (while in other sections only a new water channel was built). 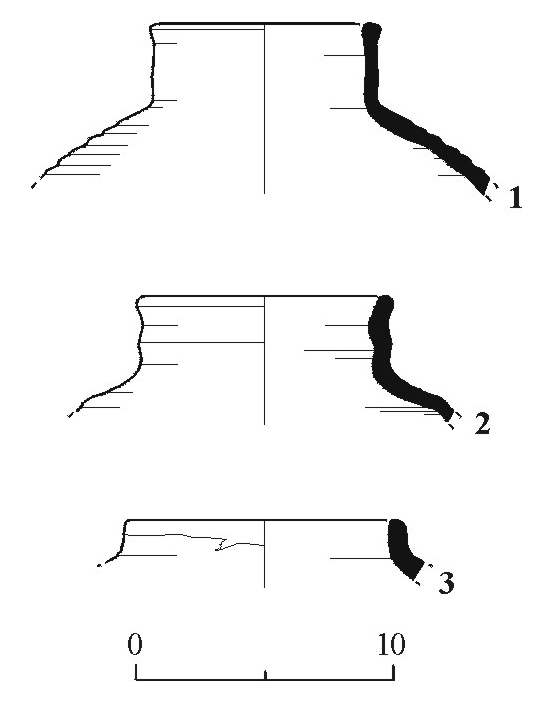 The construction style, the dimensions and the intervals between the piers of Aqueduct C are different from those of Aqueducts A and B. The channel’s floor of Aqueduct C was not exposed in any part of the excavation area. On the eastern bank, shaped cornices (imposts; Fig. 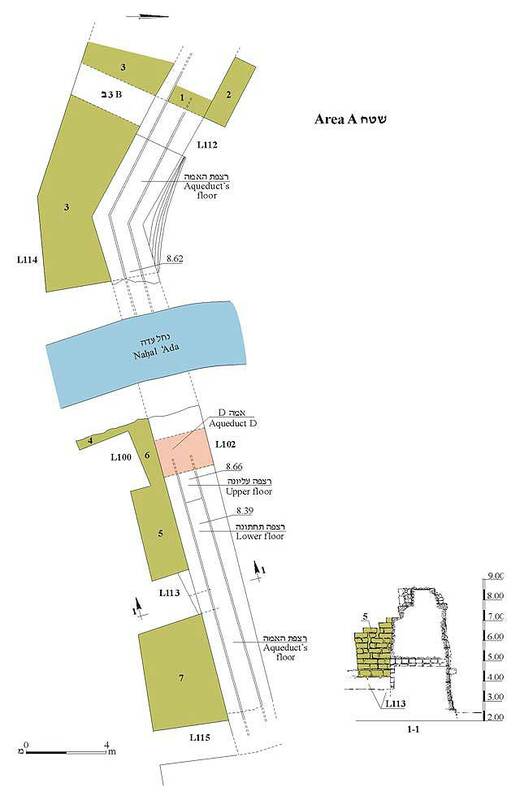 4: Section 1-1) were exposed on the upper eastern part of Pier 5 and in the western part of Pier 6 (L202). These were most certainly used as a base for the wooden frame on which the arch that supported Channel C was built. Remains of two ancient piers of Aqueduct D protruded to the south (Loci 203, 216) below Piers 5 and 6. A built blockage between Piers 4 and 5 supported the arch and had within it a narrow passage with a pointed arch at the top for the flowing water (? ; Fig. 5). North of the aqueduct, a roadbed (0.3–0.4 m thick) whose width is unknown because its northern edge lies beyond the excavation limits, was exposed. The roadbed, flanked by fieldstones along its sides, consisted of crushed and tamped kurkar (stone-dressing debris). The elevation of the road was 3.5 m above sea level (L213) and it seems to have been a service road for the construction and maintenance of the aqueduct. On the western bank, the beginning of sloping construction in the upper part of Pier 2 (L206), which was meant to be the foundation for Channel C and is known from other sections of the aqueduct (Fig. 4: Section 2-2), was exposed. The meager remains of two thin walls (L209), probably retaining walls or a later blockage that connected Piers 2 and 3 were exposed. The remains of the pier of Aqueduct A (L212) protruded to the south beneath Pier 3. 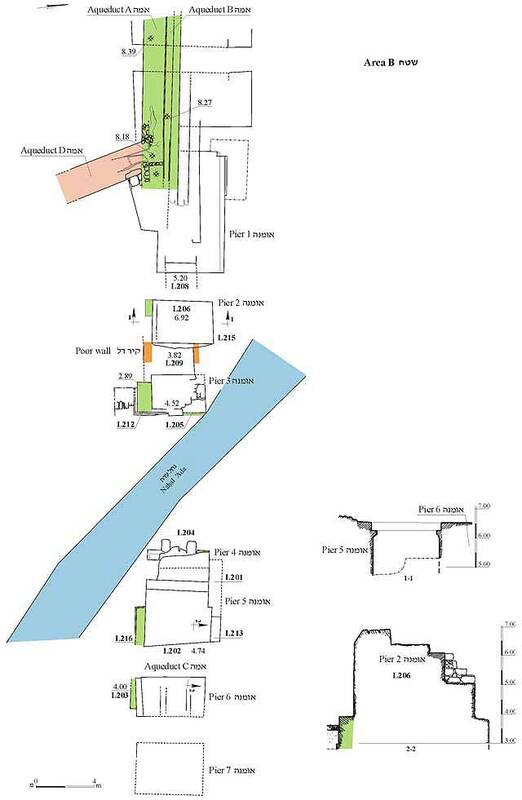 The excavation findings are insufficient to unequivocally date the construction of Aqueducts C and D. However, it is possible to date the construction of the thickenings in Aqueduct D (Area A) to the fifth century CE, based on the late potsherds found in their foundations (Fig. 6:1, 2). The late piers of Aqueduct C (Area B) are also dated to the fifth century CE, based on the late potsherds found below the foundations of the thickenings, which were partly dismantled during the excavation (Fig. 6:3). This dating corroborates that of Y. Porath (‘Atiqot 10:109–110 [Hebrew]). 1. Location map of excavation areas. 3. Area A, Arches 113 and 115 and their thickenings in Aqueduct D, looking north. 4. Area B, plan and sections. 5. The narrow passage between Piers 5 and 6, looking south. 6. Pottery from Areas A and B.